Baylor>Robbins College of Health and Human Sciences>Faculty & Staff>Faculty Directory>Rodney G. Bowden, Ph.D.
Dr. Bowden has been in higher education for two decades and joined Baylor in August of 2000 after five years at a previous institution. 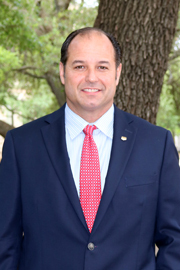 He served for eight years as an Associate Dean for Graduate Studies and Research in the School of Education at Baylor prior to his role as Executive Associate Dean in the CHHS and has the rank of Professor of Health Education. As an AD in the School of Education he was responsible for sixteen graduate programs, research initiatives, research and outreach centers and leadership of the Graduate Education Advisory Council. He also served as a visiting scholar for six months at the University of Hawaii-Manoa in Honolulu, Hawaii. Dr. Bowden has an extensive background in research including grants, sponsored projects and publications in the areas of lipid metabolism, inflammation and clinical cardiovascular disease in chronic disease populations as well as other ancillary related research areas. He has been awarded approximately $6 million in extramural funding as a principal or co-investigator. Additionally, he has published over 70 peer-reviewed publications in various journals such as the Journal of Renal Nutrition, Nephron Clinical Practice, Journal of Nephrology, Postgraduate Medicine, American Journal of Health Behavior, Clinical Lipidology, and the American Journal of Health Education. Students have been included as a primary author or co-author on most publications. Finally, Dr. Bowden has presented over 160 research or practice related presentations at discipline specific scientific conferences with over 100 published abstracts in journals and conference proceedings with most including students as primary or co-authors. Dr. Bowden has served the profession through numerous professional roles including serving in leadership and/or conference reviewer for the American Academy of Health Behavior, American Association for Health Education and other professional organizations. He has served as an associate editor, journal reviewer or guest reviewer for over 25 journals. Currently, Dr. Bowden is active member of the American Academy of Health Behavior, the American Public Health Association and the Council for Undergraduate Research.